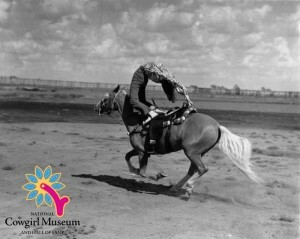 Nancy began her trick riding career on a borrowed horse at the Texas Cowboy Reunion in Stamford, Texas. Trained in tap and acrobatic dancing and educated in drama at Brenau College, Nancy worked rodeos as a child trick roper. She discovered trick riding, invented a signature stunt, the “Falling Tower” and became the feature attraction in the major rodeos by seventeen. An accomplished horsewoman, Nancy also won the GRA World Champion Cutting Horse title twice.